2019 March: XSEDE provides us computer time! The Extreme Science and Engineering Discovery Environment XSEDE awards computer time to our lab to perform our research (grant TG-MCB160059). Excited to be @BiophysicalSoc for #BPS2019! Our lab gave a talk on the off-target effects in #CRISPR and a poster on its #allosteric regulation with great feedback! We are also honoured for being at the #Art&Science contest with our COVER ART! 2019 February: CECAM workshop on multiscale modeling! Giulia organised the CECAM workshop @EPFL on the next frontiers in musicale modeling. To highlight the state-of-the-art, to tackle the current challenges and to inspire future innovations! The outcomes of this workshop are being featured in a Special Issue on Frontiers in Molecular Biosciences! 2018 Fall: Our lab is growing! Brandon Mitchell and Nasim Farajpour join the lab as a graduate students, with Dominic Biondo who is currently rotating. Two undergraduate students have also joined the lab: Marco Medrano and Ponmathi Jayaseelan. Read more about their projects!. 2018 July: CECAM workshop on modelling metal ions! The CECAM workshop that Giulia co-organised @ParisTech Frontiers and challenges of computing metals for biochemical, medical and technological applications featured impressive advances in the computational modelling of metal ions!! 2018 July: The Palermo lab is up and running! The Palermo lab is up & running at the University of California Riverside. Our lab gets equipped with four Linux workstations, which include two GPUs (an Nvidia GTX-class for GPU computing and an Nvidia Quadro for interactive visualization) and 12 Intel Xeon cores. High Performance Computing is provided us thanks to the UCR HPCC and XSEDE (grant TG-MCB160059). 2018 June: we are on the cover! Many thanks to the Journal of Chemical Information and Modelling (#JCIM_ACS) for Investing in the Future! It is a honour and a pleasure having been selected for the Early Career Board of the #JCIM_ACS. I am proud to be part of a team of brilliant young scientists for pushing the frontiers of computer simulations! 2018 February: The Biophysical Society features our research! I am honored to be part to the prestigious symposium “Future of Biophysics” of the Biophysical Society, presenting our research on the mechanistic understanding of genome editing technologies. This has been an amazing experience with top scientists across the globe. 2017 November: Best use of HPC in Life Sciences! I am happy to receive the 2017 HPC wire prize for Best use of High Performance Computing (HPC) in Life Science! This prize recognise the effort we have done over the years to bridge high-level theoretical chemistry with real-world biological sciences. 2017 August: Allosteric effects in CRISPR-Cas9! 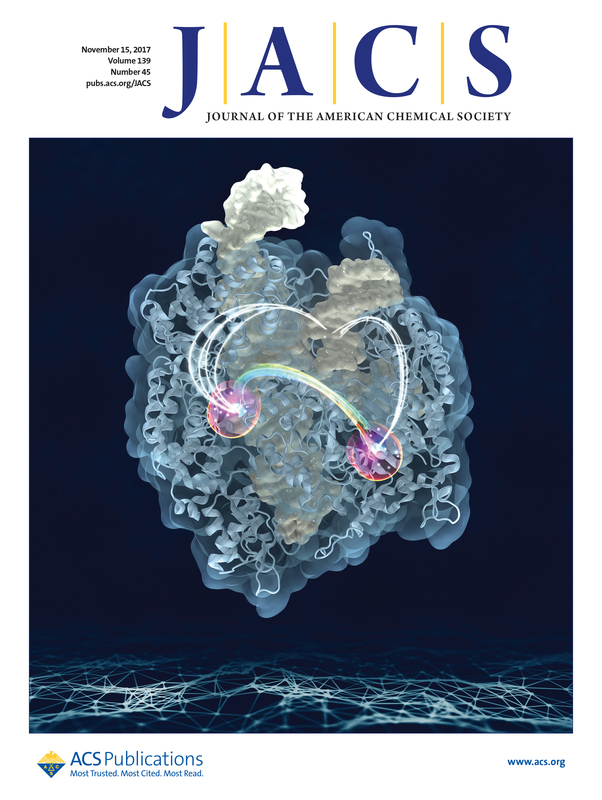 By using molecular dynamics and network models derived from graph theory, we published in JACS the discovery of an allosteric mechanism in CRISPR-Cas9 that enables for DNA processing upon recognition! We are on the cover with the beautiful artwork of Dr. Clarisse G. Ricci! Our paper in PNAS highlighted in the San Diego Supercomputer Center news! Our supercluster ‘Comet’ helps break the “millisecond barrier” for complex biological simulations. Read how Gaussian accelerated Molecular Dynamics (GaMD) simulations helped in understanding the conformational activation of CRISPR-Cas9. Molecular dynamics and X-ray crystallography have discovered that combining an anticancer drug with an antirheumatic produces improved effects against tumors. Our paper in Nature Communications paves the way for novel strategies in anticancer drug discovery. Read our story on Science Daily and in French on 20min! 2017 February: First place prize at the Art & Science image contest! We thank all members of the Biophysical Society for having awarded us the first place prize at the 2017 Biophysical Society national meeting in New Orleans! I am equally sharing this prize with my friends and colleagues Amelia Palermo (ETH-Zürich, handmade painting) and Lorenzo Casalino (SISSA-Trieste, digital manipulation). First simulations of CRISPR-Cas9 published in ACS Cent Sci. We predict the key role of the non-target DNA in the activation process with insights for structure-based engineering toward improved genome editing! Check it out in the news! 2016 June: Cover of the AMBER 16 manual! AMBER is a simulation code and – more broadly – a school for rigorous molecular simulations. I feel excited for being on the cover of the AMBER 2016 reference manual with my painting of the “Steitz & Steitz” mechanism. This painting describes the role of metal ions in the enzymatic processing of DNA & RNA, which is a paradigm in biology, discovered in 1993 by Seitz & Seitz! We have published mechanistic investigations via theoretical methods in Acc Chem Res and in JCTC. By using quantum/classical molecular simulations and the Car-Parrinello approach, our paper in JACS describes the mechanism of RNA cleavage, in self-splicing ribozymes! This paper poses the basis for understanding splicing in humans. Read our press release on Science Newsline Biology and Science Daily. Metal drugs are a challenge for molecular simulations. By using quantum-classical simulations, we revealed how novel metal drugs compounds interfere with chromatin compaction and post-translational modifications, being promising against cancer. Read our story on Science Daily.